"They made this bargain with the devil: Every seven years their best boy is sent into the forest from sundown to sunrise, on the night of the Slaughter Moon. He will live or die on his own mettle, and for his sacrifice the devil blesses Three Graces." Thank you Edelweiss and Margaret McElderry Books for sending a review copy in exchange for an honest review. When reading the synopsis of this book I instantly fell in love with it. I also had a feeling that it would be one of my favorite reads of 2018. Sadly, it took me forever to get this book done and I have to admit that this one simply just wasnt for me. This book is definitely atmospheric. It was like being in a lucid dream and I had no problem with that. The pacing was extremely slow for me, and I usually dont have issues with slow books but maybe I read it at the wrong time. I was often confused as to what was going on. I mean the writing was beautiful at times but I did get lost quite a bit. I also felt like the magic wasnt explored thoroughly. I felt like there was still more to figure out. “He was bold and powerful, beautiful and dangerous, but he loved the first Grace witch, and it was from that love the bargain blossomed. This valley is made on love, little bird. Find love. Seek it, always. That is where our power resides.”. Since I had a hard time reading this I didn't really form any attachment to the characters. They were each complex in their own way though. The story picked up towards the end, and I’ll admit I did enjoy the last 100 pages more than the rest. The plot twist was great since I didn't see it coming. This book definitely amazed me in how very strange it was. I cant really find other words to describe how I felt about this book. I can’t seem to get my ideas across so I’ll just leave it at this. This book was so atmospherically wonderful. It felt like The Witch by way of Juliette Marillier. Don't miss this when it releases in September! This was a great start to my spooky month. Because, sorry everyone, September is officially October Eve for me. While I did enjoy this, I had some pros and cons while reading it, which I’m going to make as succinct as possible for y’all. Ther This review can also be found on my blog! There are three main characters to this. Mairwen, a girl who is wild and a witch. Rhun, a boy raised for the slaughter as a saint. And Arthur, a boy who was raised as a girl and finds it hard to balance the gender roles presented to him. All of them are great in their own way. They’re all queer, which makes it so nice to read. They’re unabashedly queer without there being some need to exactly name what their sexuality is in this world. They are who they are and that is all that matters. However, I didn’t get extremely attached to any of them. While they were was definite development there, they felt more like plot elements. (And, in part, I think that’s the really bad formatting that the e-copy had. Made it kind of hard to track sometimes. The plot follows one specific time in their town of Three Graces. Long ago, three witches made a pact with the devil. In exchange for safety, every seven years on the slaughter moon the best boy will sacrifice his life to the devil in the forest. Mairwen is a witch who will bind the best boy. She is in love with Rhun and with Arthur. (And, yes; it’s polyam!) Rhun is the one everyone believes will be chosen to sacrifice himself. Arthur, constrained by his own dilemma, wants to prove himself as a boy and be the best. Also, Arthur has so many issues accepting his sexuality, that he’s attracted to another boy because it’s so ingrained in him that he shouldn’t be that way. One thing about the book that’s a pro and a con is that it just throws you in. There’s no info-dumping — a personal pet peeve of mine. You just start from the beginning of the day to the end of the ordeal. And, that’s it. The only con of that approach is that it’s hard to keep track and categorize the world that you’re in. It worked and it didn’t work for me, if that makes sense. Ultimately, I think it worked better than infodumping it all, but it still was hard for me to get it down since I was reading this at work during slow times. Also, it was so smooth with POV changes. It’s written in each main character’s perspective, yet each were so distinct that I followed despite the odd formatting. I love that and it takes a whole lot of talent from the author to do that. Props to Gratton for that! An element that really worked for me is how this is medieval without it explicitly being stated. That meant my brain — which LOVES anything medieval — was jumping off and thinking about relics and the belief of magic in the world and the interpretation of forests and everything else. Seriously. I loved that and that is another reason this got bumped up to four stars. It also got better as I read it. At first, it was three stars because I wasn’t too attached to anything. Then, it went to three and a half because I was getting into the plot and the general story. Then, to four because I started understanding the characters better and their motives and characterizations. Plus, I just love polyam rep. I love polyam relationships and I really enjoyed how this never exactly said it was that, but it was so obvious to everyone. Kind of like The Wicker King; it never said it, but implied it to the point you couldn’t ignore it. Thanks megs_bookrack for the copy!!!!!! Strange Grace is a high fantasy novel featuring a polyamorous relationship, terrible bargains, and the creepiest forest since Uprooted. Which means, of course, that it was exactly my thing. I read it in less than a day - thanks to rivetedlit I could read it legally for free and not for the 11€ this ebook costs, but only for one day - and it's been a while since I did that without skimming. I loved this book so much, for many reasons. One of them is, of course, the polyamory representation. 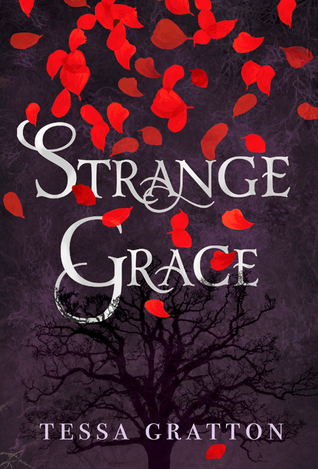 This is Strange Grace is a high fantasy novel featuring a polyamorous relationship, terrible bargains, and the creepiest forest since Uprooted. One of them is, of course, the polyamory representation. This is the first YA fantasy book I've ever read that follows a polyamorous (f/m/nb) triad, and it shouldn't be this rare, for a genre that until 2016 was basically made up of love triangles. 🍂 Arthur Couch, white, all sharp edges and denial. He was raised as a girl by his mother who didn't want him to ever become a martyr. He was "discovered" when he was six, and since then, he has struggled to fit in. His character arc about understanding that he didn't need to fit into a box other people tried to force him in was one of my favorite parts of the book. It's strongly implied that he is non-binary. I loved all of them, especially because of their relationship dynamic, but I have to say that Rhun and especially Mairwen weren't as developed as they should have been, and that Arthur ended up being a far more interesting character than both of them. I loved Arthur also because of what he represented. In the acknowledgments, the author mentions her frustration with gender roles in modern paganism, and I loved what this book said about gendered magic. The worldbuilding is not trans-inclusive by any means, it's intentionally binarist, but it lent itself to a really good exploration and dismantling of gender essentialism. And let's talk more about the worldbuilding: it isn't in-depth, not really, but I actually prefer this for fairytale-like stories, explaining too much takes away the magic. It reminded me of the distant-and-yet-so-close feeling The Boneless Mercies gave me a few months ago. But that's not to say the worldbuilding was bad or inconsistent; it just left a lot of things implied. It's implied that this is set in a transphobic and homophobic society, but you see little of the transphobia and even less of the homophobia because you're following a mainly-queer cast and these main characters aren't - apart from some internalized stuff in Arthur's case - homophobic or transphobic themselves. I know it's almost winter, but Strange Grace is such a fall book. It's atmospheric and creepy and it's set among the vivid reds and oranges of a forest during the fall. It's beautiful, as books written by Tessa Gratton usually are - really, if you like pretty writing and atmospheric epic fantasy, read The Queens of Innis Lear - and it's also deliciously bloody. So many twisted bargains and mysterious creatures. Also: I didn't see that coming. I don't know how I missed that. Strange Grace's pacing was better than I expected. I actually liked its structure and the way some things kept coming up through flashbacks. It added to the mystery and even to the atmosphere, in a way. But my expectations were low, because the Innis Lear book was so slow it was almost painful. And there's yet another reason this book meant so much to me: it's about a creepy forest. I don't like creepy forests just because they're atmospheric and I love vivid settings, but because I grew up with an unlikely plant-related phobia. It's just the kind of horror that appeals to me, I always feel like these books get it. The trees are as creepy as they're beautiful and they're not to be trusted. But there are some things I didn't love. While the side cast was interesting and had some really well-written characters like Haf, Vaughn, Baeddan and Adalyn, two of the main characters slightly disappointed me (but I still loved them). Also, something about the writing of this book felt very... pinterest? Like, it was beautiful, but I could just see from which pictures some of the body horror descriptions here came from. And another thing, since I'm nitpicking now: I'm tired of YA authors describing brown eyes as plain. Green eyes are emerald and surprising, blue eyes are intense, and brown eyes are... plain. It happens in so many young adult books. Can we not. Thanks so much to Simon and Schuster Canada for providing me with an eARC of this via NetGalley! Strange Grace has such a compelling, eerie premise: every seven years, a boy is sent into the Devil's Forest as a sacrifice to allow the village and its occupants to remain safe and prosperous for the next 7 years. Except, one day, this spell is inexplicably interrupted 3 years into the 7 year interval. THE MYSTERY. THE SUSPENSE. And I gotta admit, the first couple of chapters of this book were ver Thanks so much to Simon and Schuster Canada for providing me with an eARC of this via NetGalley! Strange Grace has such a compelling, eerie premise: every seven years, a boy is sent into the Devil's Forest as a sacrifice to allow the village and its occupants to remain safe and prosperous for the next 7 years. Except, one day, this spell is inexplicably interrupted 3 years into the 7 year interval. THE MYSTERY. THE SUSPENSE. And I gotta admit, the first couple of chapters of this book were very exciting. I wanted to find out what would happen and the air of mystery surrounding the whole thing was enticing. I also really appreciated the prominent role that diverse representation played in this story. There's great LGBTQ rep (it's hard to tell what the characters identify as since they don't explicitly use labels, but to me it seemed like the main characters were bi- or pansexual), gender identity rep (again, I can't tell for sure, but one of the main characters read to me as non-binary), and also one of the POV characters is black. Regardless, my initial interest in all of these things--the premise and the rep--waned and I was just left feeling more underwhelmed than anything. About halfway through the book I realized that I wasn't enjoying this story anymore. I think my issue with this is that the story feels very static. It has plenty of highs and lows, and yet they never really feel all that high or low. Consequently, neither the story nor its characters end up reading as dynamic. Also, something about the writing style made this quite hard to follow. I don't know if this was just me, but I had a lot of trouble visualizing scenes because the logistics were so hazy and the transitions very abrupt. This is one of the most conflicting reviews/ratings I've given lately. Strange Grace is dark, creepy and just the right amount of gory for me. So you'd think it would hit the mark for a teen fantasy read. And it mostly does. However there are moments and times where I feel like something was missing or a connective tissue wasn't quite there. Also refreshing is that it's a stand-alone!! When you write a book that focuses on tidbits of information dropped like easter eggs throughout t This is one of the most conflicting reviews/ratings I've given lately. Strange Grace is dark, creepy and just the right amount of gory for me. So you'd think it would hit the mark for a teen fantasy read. And it mostly does. However there are moments and times where I feel like something was missing or a connective tissue wasn't quite there. Also refreshing is that it's a stand-alone!! When you write a book that focuses on tidbits of information dropped like easter eggs throughout the narrative you need to be very confident that you've given enough context for the reader to have an 'ah-ha' moment when that tidbit becomes relevant. This was the biggest missing piece for me with Tessa Gratton's dark novel. It felt like the 'ah-ha' moments were dulled or just not even there. The one key moment, where you go 'OMG', I did have a reaction to; but even that felt a little muffled by the attempt to stay up on what I'd been told to date. I'm not quite sure how else to describe what was missing except to say that a good mystery or thriller author could likely solve this issue quickly as I believe it would be obvious where the links are not meeting. Ever since I read LOTR at age 12 I have been vehemently against flashbacks. I abhor being told what happened for key moments if the flashback isn't in a journal entry, orally being told story, or really, really interesting. Luckily for Gratton she fits into the really interesting category. It's a very risky thing to tell 90% of your compelling story in flashbacks; and yet that is exactly how Strange Grace is set-up. This format allows for bits and pieces of the story, from different characters POV, to be told in a jumbled up way which could work but in this case I'm not sure it was as effective as it could be (see foreshadowing above). The absolute best endings to me have a few things in common. They don't please everyone, not everyone survives (if applicable) and everyone leaves changed. Without a doubt Gratton meets my ending criteria. It also helps that the romance in Strange Grace is fairly well done. It's a typical confused and conflicted teen romance (between three people); but I really loved the way Gratton incorporated the pan sexuality into the complex trio's lives. I genuinely believed that a three-person relationship would be possible in certain scenarios here. And not because the characters were trying to all be happy but because it just made sense for these characters. It's difficult to handle a unique teen romance, in a vicious, fairly bloodthirsty book without having the trauma become 99% of the focus. But somehow Gratton manages to give us three independent and unique characters who all need each other and not just because of the horrors they may (or may not) have witnessed; but instead because their souls feel entwined. I realize this may sound lame... (or maybe it's because I have a hard time with romance) but I felt like this was a teen romance that I could understand and support. The darkness and romance of Strange Grace certainly pushed me into 3-4 star territory (there is also a really good moral dilemma); but the missing 'ah-ha' moments and lack of lines to tug on brought it down. I feel if Gratton paired up with a couple great mystery editors or writers for comments, reviews and edits that this could be a stellar book. I will certainly read Gratton's books in the future as I believe her and I have something in common. A dark place in our souls that we don't quite know what to do with sometimes. Strange Grace touched that deep place (that all of us have to some degree) and gave it a life (that is less horrific and more gothic) for a short period of time.